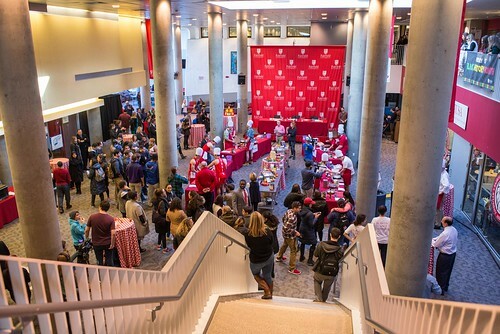 The lower level of the BCC was buzzing last week during the first Meatball Mania student competition hosted by Iron Chef Judge Donatella Arpaia ‘93. Teams from FUSA, Kostka Hall, The Mirror and the Rugby team competed in a timed Iron Chef-style cooking competition and presented their final product to a panel of judges. Teams were judged against the following criteria: taste and flavor, presentation, creativity, teamwork and team spirit. The judges, restaurateur and lifestyle brand Donatella Arpaia, FUSA president Anif McDonald ‘16 and lifestyle personality and media consultant Sissy Biggers, sampled two meatballs from each team. Teams had one minute to make their presentation to the judges and answer questions. Each team shared the story behind their meatball recipe, some of which originated from The Food Network and others from longtime family recipes. In the end, team Kostka Hall took the win for best meatball and Donatella commented how she “liked the use of peppers,” something she explained is not typically used in Italian meatball recipes. Donatella also noted that she may have to try incorporating peppers in a variation of her own meatball recipe in the future. See for yourself the excitement and energy from the teams and spectators at the Meatball Mania event. Click through the album below or view it directly on Flickr.